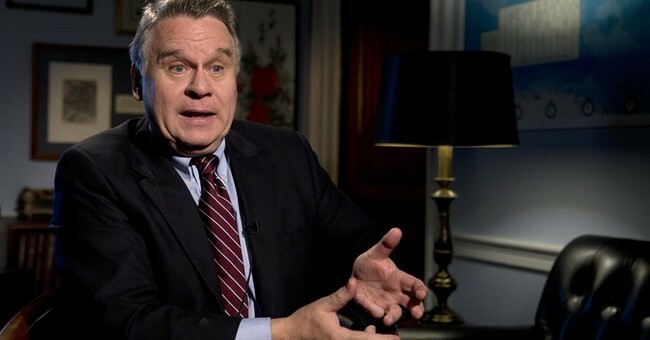 Washington, D.C. - Rep. Chris Smith (R-NJ) spoke with Townhall Friday at the March for Life rally and applauded President Trump’s announcement in his pre-recorded video address at the rally that he was signing a letter to Congress saying that "if they send any legislation to my desk that weakens the protection of human life, I will issue a veto." Smith, along with Sen. Steve Daines (R-MT), wrote companion letters to President Trump Wednesday calling on him to reject any legislation that weakens pro-life policy. Those letters were signed by 169 members of the House and 49 senators. “No matter what is stuffed into an appropriations bill, including things we might want, if it takes the lives of children or facilitates their violent destruction, he’ll veto it and we will sustain it,” Smith emphasized. The president’s veto promise comes after House Democrats, as part of a funding bill to re-open the government, attempted to essentially repeal President Trump’s expansion of the Reagan-era Mexico city policy that prohibits the use of taxpayer funding for abortion overseas. Pro-life groups, including the March for Life, also praised the announcement. "We are so grateful to hear directly from President Trump today that he will be steadfast in his commitment to protect the most institutional of pro-life provisions,” Tom McClusky, president of March for Life Action, commented. “Many of the policies that Speaker Pelosi threatens, for example the Hyde amendment, are bipartisan pro-life protections supported by the American consensus. New Marist polling released this month shows that the majority of Americans would prohibit tax dollars from paying for abortions with taxpayer dollars and do not support forcing health care professionals to participate in an abortion." In his speech at the rally, Rep. Smith discussed the numbers of unborn children aborted since the Supreme Court’s Roe v. Wade decision. “The shocking number of unborn children killed in America is unconscionable: 2,500 each day, approximately 61 million dead babies since 1973—a death toll that equates with the entire population of Italy,” he said.